Antique 1880 Barstow Stove Co. Prov. R,I. 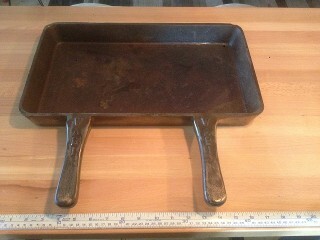 cast iron french roll pan, measures 13 3/4" x 8 1/8" x 1 3/8", weighs 6 1/2 lbs. (Sold). Antique cast iron Danish apple cake pan, it measures 10 3/4" x 7 3/8" x 1 3/4", (Sold). 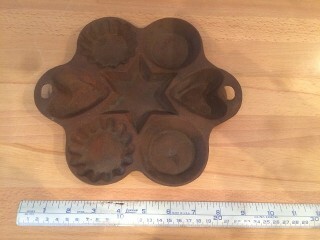 Antique cookie or soap cast iron pan, it measures 9" x 8" x 3/4", (Sold). 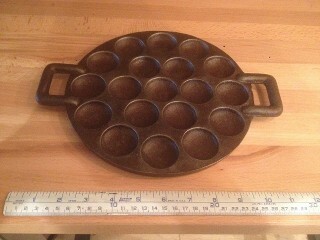 Antique Dutch Poffertjes cast iron 9" pan with 19 dimples, (Sold). 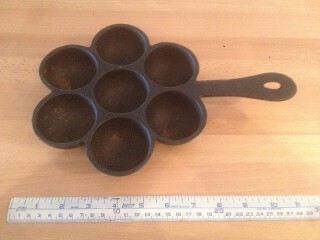 Antique Wagner Ware cast iron muffin pan, Made in USA, 11" x 7 3/4" x 1 1/2", (Sold). 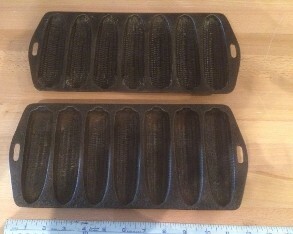 Two cast iron cornbread pans, they measure 12" x 5 1/2", (Sold). 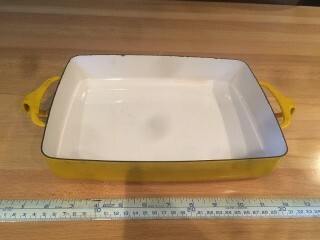 Vintage DANSK France Kobenstyle yellow enameled cast iron casserole baking pan, 10 1/2" x 8" x 2", asking $30. Wabi double handle nickel plated cast iron 17 3/4" x 10 1/2" x 2" high, it weighs about 20 lbs. (Sold). 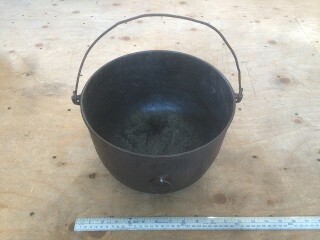 1892 Gurney #9 cast iron cauldron with 3 legs, 10 1/2" dia. x 7 1/2" high, asking $60. 1.) 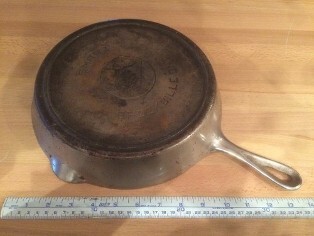 Wagner Ware 10 1/2" x 1 3/4" skillet, (Sold). 2.) Wagner #1056O Ware 9" x 2" skillet, (Sold). 3.) 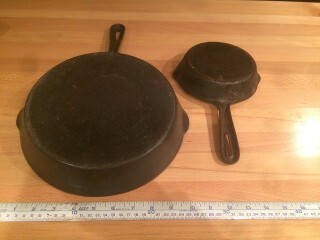 Wagner Ware 8" x 2" , #5 skillet, Asking $45. 4.) Wagner Ware Sidney 6 1/2" x 1 1/2" #1059O $45. 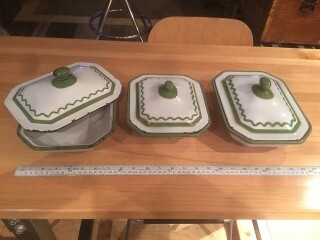 Three antique green Klafrestrom dutch ovens, 2 medium sized and 1 small sized one, they are made of heavy porcelian enameled cast iron, Made in Sweden, (Sold). 2.) 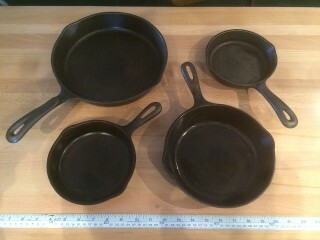 New Wagner's 1891 A, 6 1/2" x 1 1/4" skillet, $25. 3.) Made in USA. #8, 10 1/2" x 2" skillet, $30. 4.) 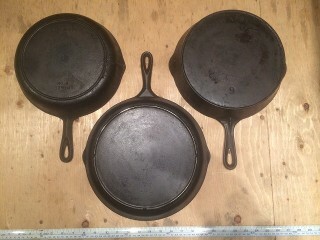 Griswold Cast Iron Skillet #5 Erie PA. USA #724, 8" x 2", asking $85. 1.) #10 with heat ring, 12" x 2 3/8", asking $45. 2.) Wapak #9 with heat ring, 11" x 2 1/4", $120. 3.) #8 Made in USA, heat ring, 10 5/8" x 2 1/4", $35. 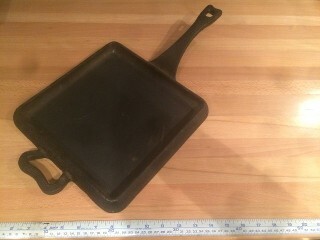 Paula Deen hammered cast iron 11" square griddle, asking $75. 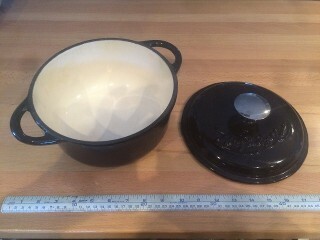 Antique Wagner Ware & Griswold B, 5 quart dutch oven, Made in USA, embossed dual logo, it measures 10" dia. x 4" deep, with glass lid, (Sold). Antique S & P Co. Phila. 16 qts. 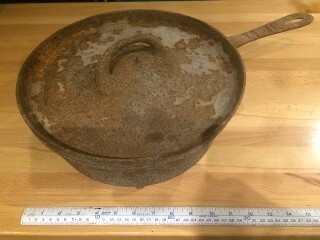 Cast iron pot, used for outdoors corn roast, measures 14" dia. x 8" high, wieghs about 16 lbs. asking $100. 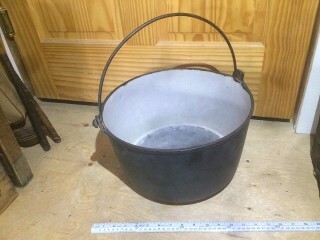 Large antique cast iron cauldron pot kettle, it measures 25" dia. x 14" high, it was used for large corn roast last, asking $900. 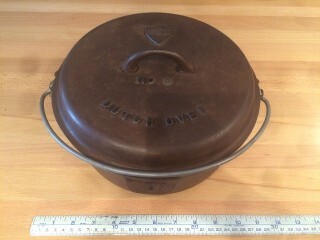 Antique GSW #8 dutch oven, 10" dia. X 4" high, (Sold). 1.) 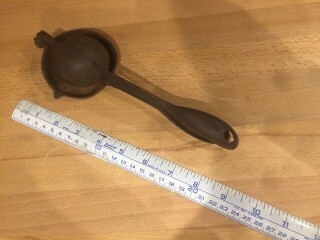 #4 Hollands Erie, PA. cast iron 17" ladle, $45. 2.) #4 PL170 cast iron 141/4" long ladle, $35. 3.) Cast iron & forged handle 14 1/4" long ladle, $30. Favorite Ware #4 with diamond G logo, 11" dia. X 4 1/2" high, (Sold). 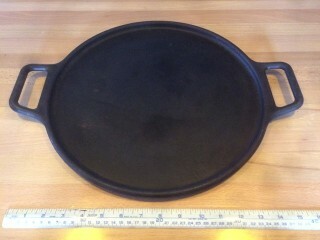 Lodge 14" cast iron P14P pizza pan, (Sold). 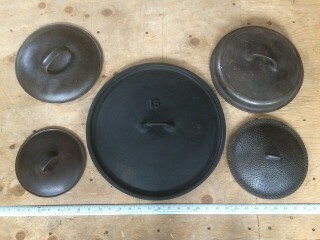 Cast iron lids, 7", 8", 9", 10", & 15" diameters, One 10" lid left for sale, asking $30. 1915 Smart Brockville #9 diamond G logo,10 3/4" x 2" skillet, nickel plated cast iron, (Sold). 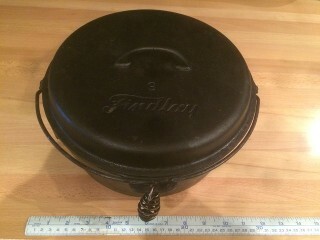 Antique #9 Findlay 5 quart dutch oven, Made in Canada, it measures 11" dia. x 4 1/4" deep, (Sold). 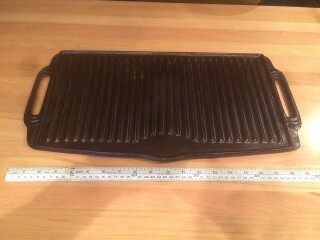 Two sided cast iron griddle, 20" x 10", asking $30. 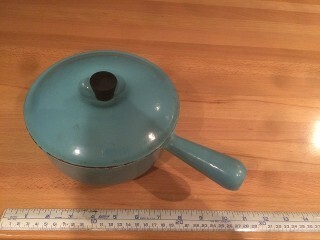 Vintage Le Creuset #18 blue porcelain enameled cast iron sauce pan with lid, Made in France, 7" dia. X 3" deep, (Sold). 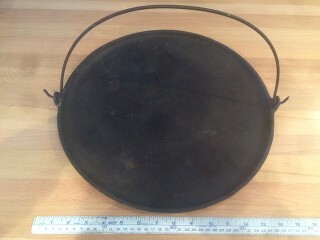 Antique 15" diameter hanging flat cast iron griddle, it weighs 6 lbs. Has 14C on bottom, asking $60. 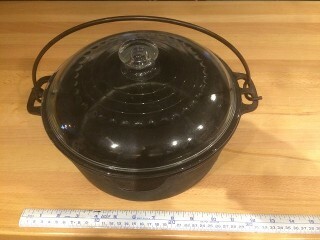 Wolfgang Puck 3 quart cast iron dutch oven with lid, 8 1/2" diameter x 4" high, it weighs 9 lbs, asking $45.. 1.) 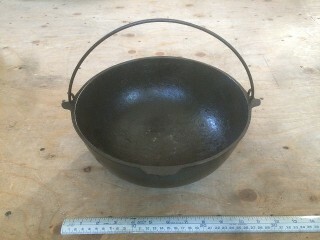 Antique Lisser Canada #3, 6" x 1 1/2" cast iron skillet, asking $35. 2. )Antique Findlay No. 8 Carleton Place, Ont. 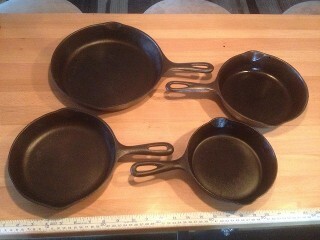 10" x 1 3/4" cast iron skillet, asking $45. Antique rusted 11" dutch oven with lid, handle and it has 3 legs, it weighs 13 lbs. Asking $120. 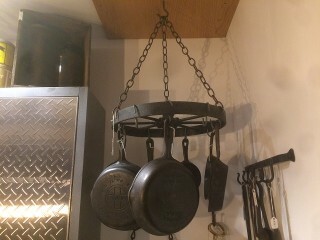 Hanging antique 15 " diameter steel wheel pot rack It hangs down 20", cast iron pans sold separately, asking $85. 1.) Griswold 12" heavy glass lid, asking $25. 2.) 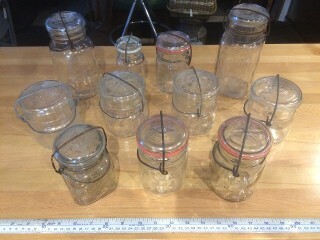 Wagner 10 1/2" heavy glass lid, asking $25. 3.) 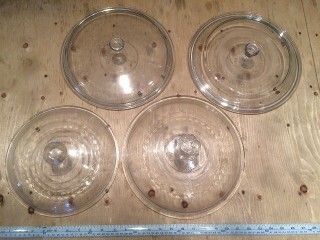 Two no-name 12" glass lids, asking $5. each. 1.) Two cornflower pattern Corning Ware 80 oz. $20. 3.) One cornflower pattern Corning Ware 10 in. $20. 4.) La Marjolaine pattern Corning Ware, 2 lt. $10. 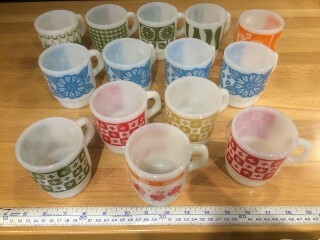 Vintage Fire King Anchor Hocking stackable coffee cups, asking $5. each. The blue set of 4 sold. 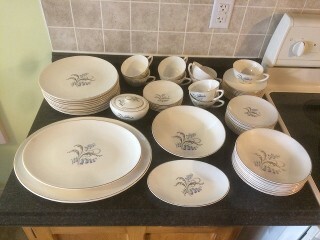 1952 Knowles Bluebells china set, 1-14 3/4" oval platter, 1-12 3/4" oval platter, 1-8 5/8" oval platter, 11-10 1/4" dinner plates, 12-6 1/4" dessert plates, 12-6 3/8" saucers, 1-8 3/4" bowl, 8-7 5/8" bowls, 6-5 1/2" bowls, 1 sugar bowl with lid, 9 cups, asking $85. 1.) 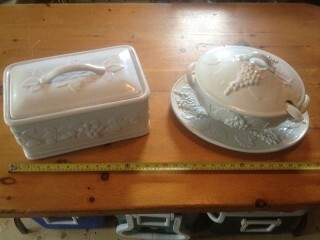 12 cup porcelain soup tureen with platter and serving spoon from Cracker Barrel, (Sold). 2.) Porcelain bread box from Cracker Barrel, $20. 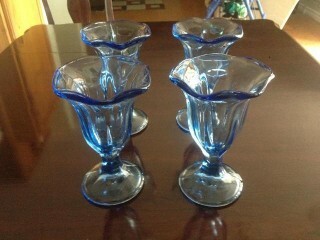 Set of 4 antique cobalt blue sundae glasses, asking $20. 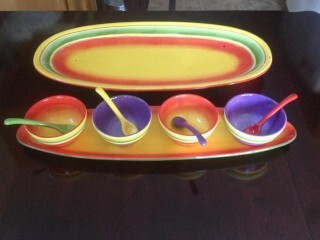 Mexican serving platter with 4 bowls & 4 spoons, It comes with the large serving platter (23" X 11 1/2") & the thinner platter (22" X 5 1/2") for the four 8 ounce bowls and spoons. It is a heavy stoneware made by Laure/Gates, asking $45. 1.) Four 1 pint Ball Eclipse wide mouth, $10. each. 2.) One 1 pint Anchor Hocking Lightning, $15.. 3.) One 1 pint Acme Sheild, asking $15.. 4.) One 1 quart Perfect Seal, asking $10.. 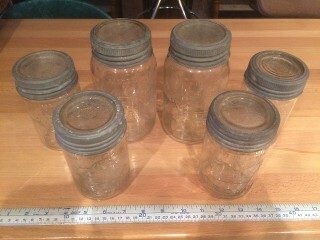 Antique Crown glass top canning jars, 2 quarts and 4 pints, asking $5. each or the six for $25. 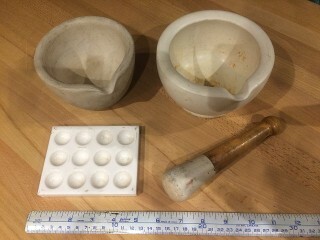 Vintage Mortar & Pestle Standard Trenton acid resisting apothecary stoneware set, asking $120. for the four pieces. Antique 100 year old cogniac, brandy, wine or cordial karaf with 6 small glasses & 6 wine glasses The set is in mint condition, a beautifull red crystal with gold trim, asking $120. 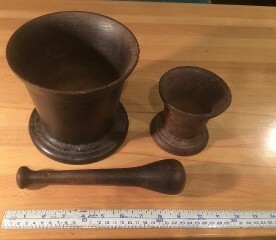 Antique 1800's pharmaceutical, apothecary, mining, heavy cast iron mortar & pestle, small mortar is 4" diameter x 4" tall, and larger mortar is 6 1/2" diameter x 6" tall, pestle is 2" diameter x 9" long, asking $220. for the set. 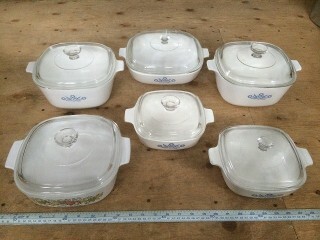 Antique heavy porcelain enamel 8 qts. 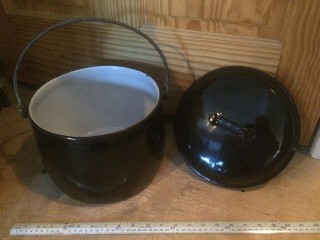 soup pot with steel bail and lid, 10" dia. X 7 1/2" high, asking $35. Zwilling J.A. 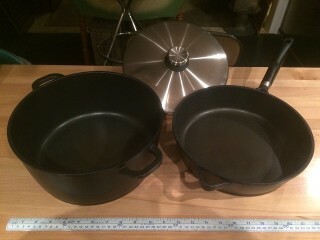 Henckels, non-stick cast aluminum 11" x 5" pot dutch oven & 11" x 3" pan, with lid, Made in Germany, asking $120. 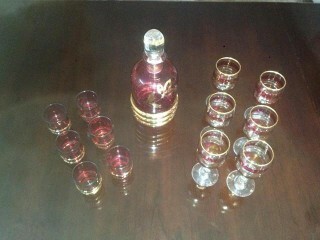 for the set. 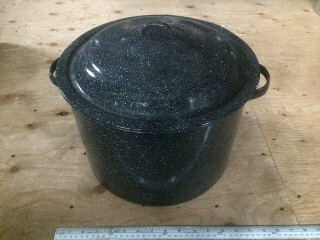 Large granite ware canning pot, Made by Martha Stewart, it measures 14" diameter x 9" tall in good condition, asking $20. 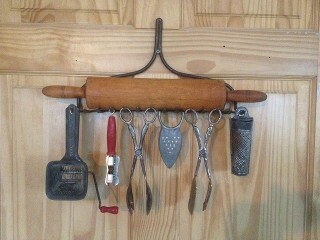 Grandma's vintage & antique kitchen gadgets, asking $5. to $25. each. 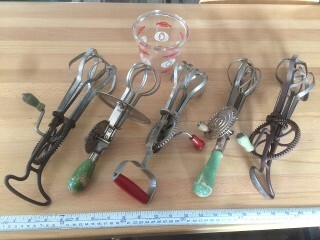 Antique hand crank mixer, egg beaters, asking $10. to $25. each. 1.) Antique pastel green Way Rite kitchen scale, Made in Chicago, weighs up to 25 lbs. asking $85. 2.) Antique 1898 U.S. family kitchen scale, patented Feb. 8, 1898 kitchen scale, it has a brass front with a cast iron top, asking $125.2.) Antique 1898 U.S. family kitchen scale, patented Feb. 8, 1898 kitchen scale, it has a brass front with a cast iron top, asking $125. 3.) Antique blue green kitchen scale, worn face, $45. 1.) Antique pastel yellow, Landers, Frary & Clark, weighs up to 24 lbs. kitchen scale, (Sold). 2.) Antique square white, Landers, Frary & Clark 24 lbs. 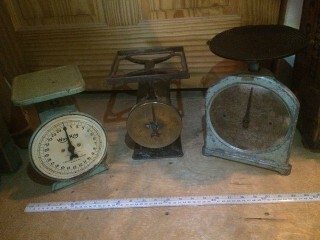 kitchen & hardware store scale, asking $45. 3.) 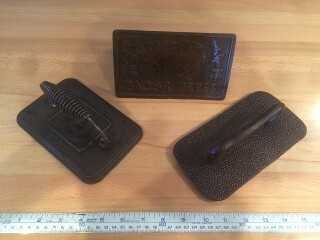 1903 antique black, Pelouze Scale Mfg. Co. Chicago 24 lbs. 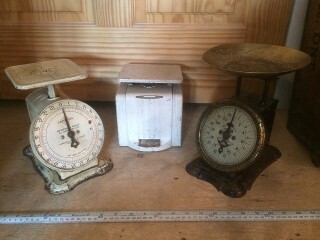 family kitchen scale, (Sold). 1.) Antique 200 lbs. 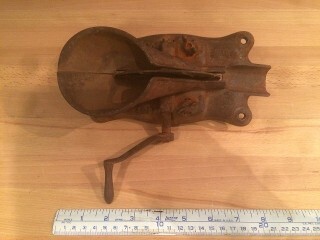 butchers meat weighing spring scale, Chatillon New York, USA, type 160, iron clad, asking $65. 2.) Antique cast iron Gifford Wood Company 300 lb. 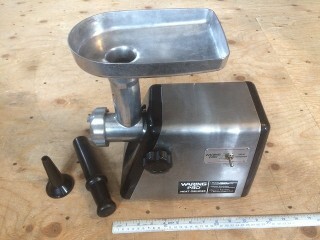 block ice weighing, spring scale, asking $120. 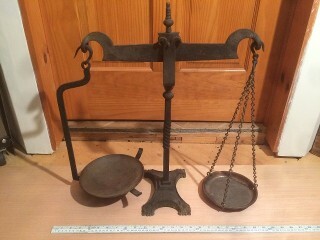 Antique red cast iron Fairbanks balance beam candy scale with copper pan, asking $75. 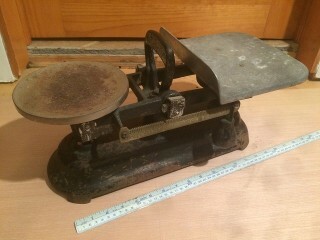 Antique Salters baby scale #50, British made, Silvester's patent, to weigh up to 28 lbs. 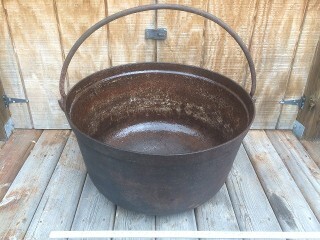 #3629, top pan measures 22" x 14" x 3 1/2", it is made of a heavy cast iron with a brass face and has a 7 1/2" diameter brass folding dome cover plate, asking $360. 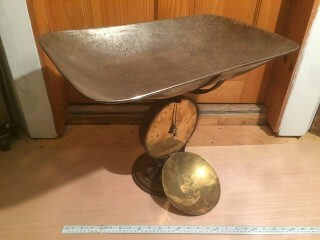 Antique Canadian Scale Co. Ltd. Made in Toronto, Canada, serial #3094, it measures 19" x 9" x 9 1/2", made of heavy cast iron, asking $85. 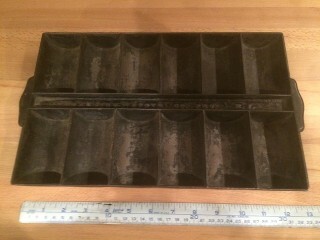 Antique 1700's early Avery Victorian grocers scale, hand forged. 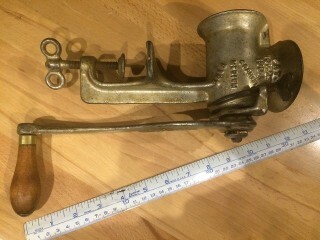 It measures 22 3/4" tall and weighs about 12 lbs. asking $260. 1.) Antique Gifford Wood Co. 150 lb. ice scale, $90. 2.) Antique C. Forschner's 60 lb. scale, asking $85. 3.) 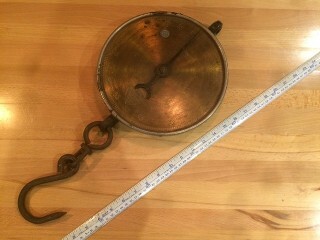 Antique Salter's 30 lb. 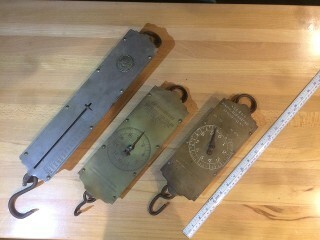 spring scale, asking $80. Antique Salter No. 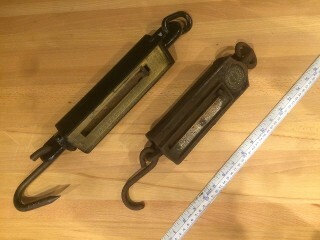 235T Trade Spring Balance Scale, Made in England, it measures 9 1/2" diameter x 20" weighs up to 100 lbs. asking $185. 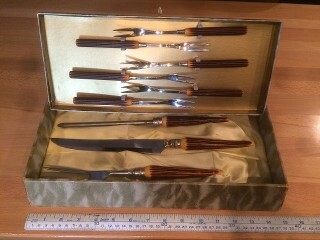 1950's box set of carving knife, fork & sharpener with red bakelite handles, asking $20. 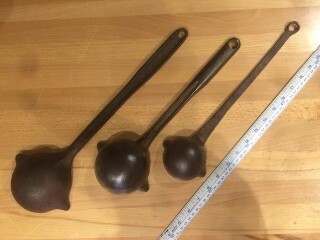 Vintage 1950's ice cream parlour scoops, one is a Tudhope #5 and three Hunter #6, all are made in Orillia Canada, asking $20. each. 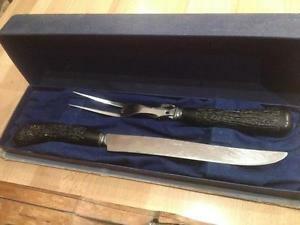 1960's 2 piece Sta-Brite knife and fork set with black antler handles, (Sold). Cole & Mason, King Pepper Jr. 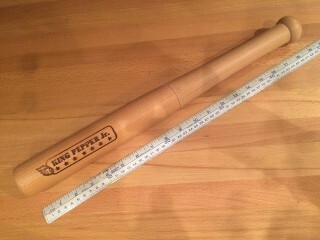 Baseball Bat pepper mill, 19" long natural beech wood, stainless steel grinding mechanism. Great for the barbecue. asking $25. 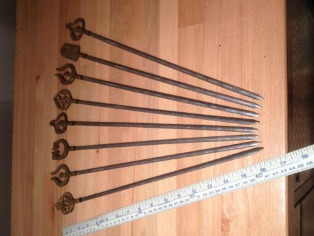 1950's set of 8 Tarzan Inox from Turkey skewers, 16" long. The designs are on both sides of the brass. They are a nice set for shish kabobs or barbeque skewers. Asking $20. 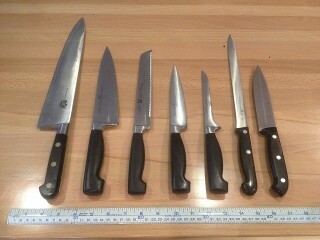 for the set of 8. 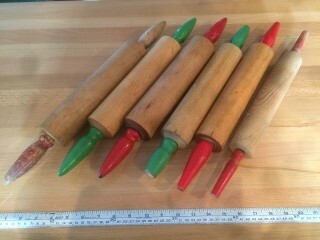 1950's antique rolling pins, asking $10. each. 1.) One vintage 1953 Gilhoolie with patent date No. 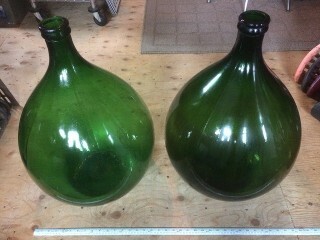 2669142, Jar & Bottle opener, asking $15. 2.) 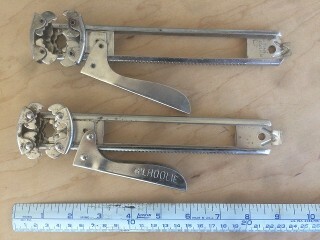 One vintage Interpur 4-in-1 Jar & Bottle opener all size lid cap opener. asking $10. 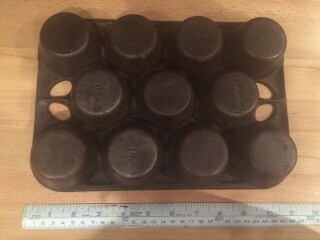 Vintage coffee cup holder, fits 8 fireking coffee cups, asking $25. 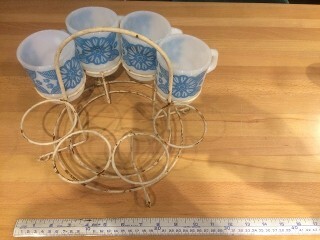 for the holder, fireking coffee cups extra. 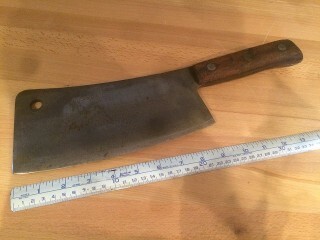 9" Patton Products 11-9, Made in Germany, 9" wide x 4" high blade, 15" long with handle, weighs 2 3/4 lbs. asking $95. 8 3/4" No-name 8 3/4" wide x 5 1/2" high blade, 14 3/4" long with handle, weighs 2 3/4 lbs. asking $75. 6" Briddell #860, Made in USA. 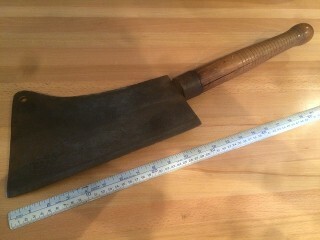 6" wide x 4" high blade, 11" long with handle, weighs 1 lb. asking $65. 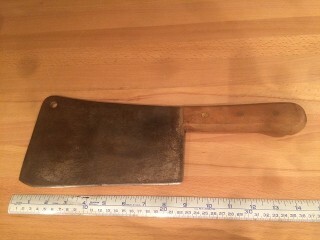 Huge antique two handed meat cleaver, 12" wide x 7" high blade, 24" long with handle, has eagle emblem on it, weighs 5 lbs. (Sold). Antique 1837 L. & I.J. White 10" wide x 4 1/2" high blade, 16" long with handle, weighs 2 lbs. (Sold). Antique Nichols Bros. Greenfield Mass. 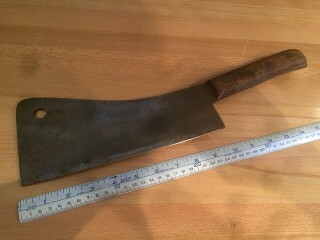 9" wide x 5 1/4" high blade, 17" long with handle, weighs 3 lbs. (Sold). 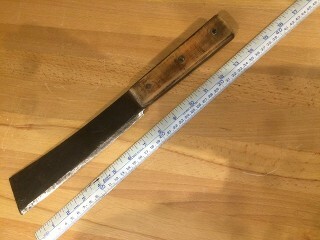 Antique Columbia Cutlery Corp. New York, N.Y. 9" wide x 4" high blade, 15" long with handle, weighs 3 lbs. (Sold). Vintage Tramontina. 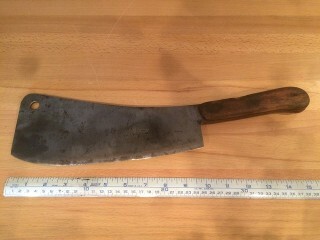 7" wide x 4 1/4" high blade, 12 1/2" long with handle, weighs 1 3/4 lb. asking $45. 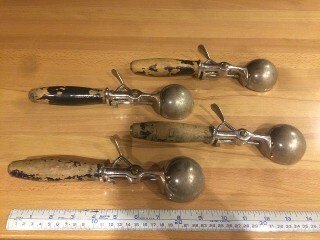 Antique unledgeable name, Made in USA. 8" wide x 4 3/4" high x 14" long, weighs 2 1/2 lbs. Asking $90. 1.) 15" Bridell USA. meat clever, (Sold). 2.) 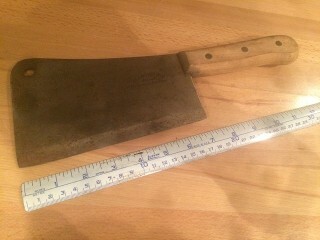 11" Foster Bros. meat clever, (Sold). 3.) 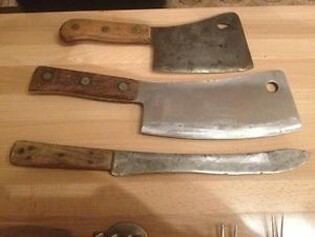 16" Premier Sheffield butcher knife, (Sold). 1.) 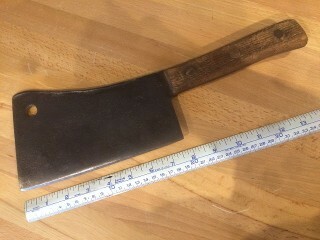 8" Zwelling J.A. Henkells Twin 4 Star Pro, Solingen Germany, asking $40. 2.) 8" breadknife, Zwelling J.A. Henckells (Sold). 3.) 6" Zwelling J.A. 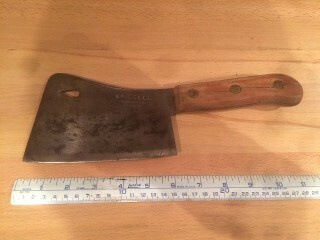 Henckells Twin 4 Star Pro, Solingen Germany, asking $35. 5.) 10" wood handled #727, J.A. Henckells Twin Zwillingwerk AG Solingen Germany, asking $30. 6.) 6" J.A. Henckells International, asking $5. 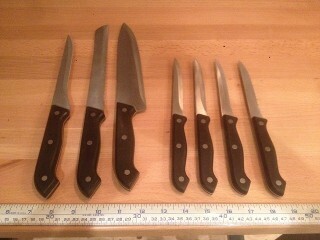 Set of 7 German Rostfrei knives, asking $90. 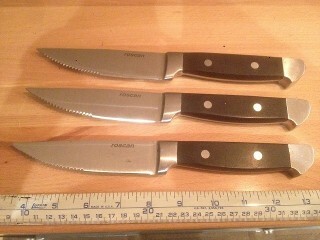 Set of 3 heavy duty Roscan steak knives, asking $15. 1.) 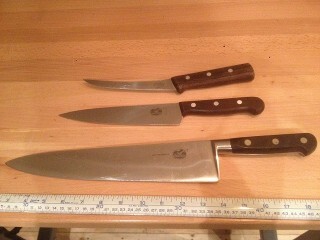 12" Victorinox chef's knife, R.H. Forschner Co. Made in Switzerland, (Sold). 2.) 7 1/2" Victorinox carving knife 5.2000.19. R.H. Forschner Co. Made in Switzerland, asking $30. 3.) 6" Victorinox boning knife 407-6, R.H. Forschner Co. Made in Switzerland, asking $20. 2.) 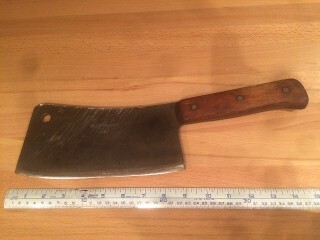 Ed Wusthof Dreizackwerk Trident Solingen Inox 6 1/2" Meat Cleaver, Made in Germany, asking $30. Vintage heavy 1 lb. 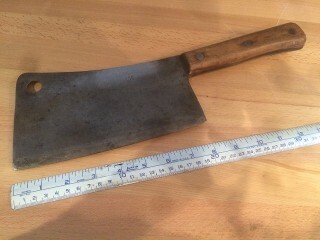 thick 8" blade chopper, it measures 2" x 14" long with handle, $45. 1.) 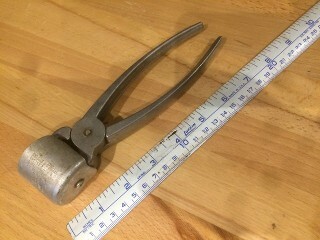 Vintage sharpening steel with brass ring guard, forged steel, Sheffield England, asking $30. 2.) 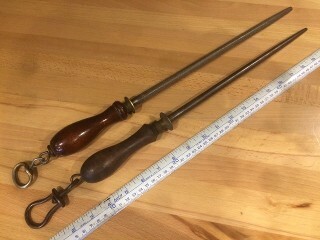 Antique 1891 sharpening steel, I. Wilson Sycamore St. Sheffield England, with walnut handle with brass ring guard, asking $40. 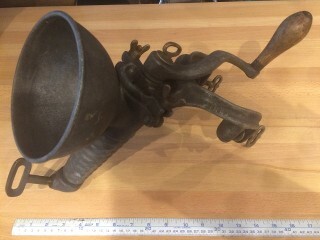 Antique cast iron lemon squeezer juicer, asking $25. 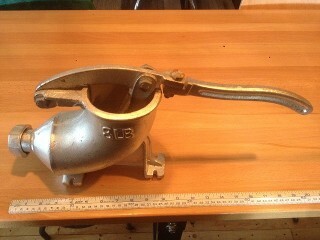 Vintage 1953 Texan York nut sheller, patent # 2,651,342 asking $15. 1.) 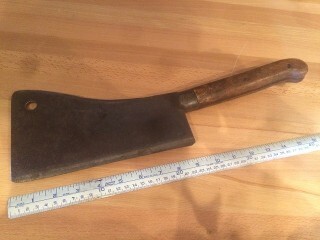 Antique meat tenderizing mallet with sharp meat cutting 2 " axe head chopper, asking $35. 2.) 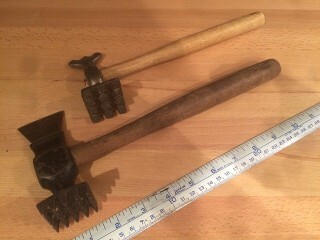 Vintage meat tenderizing mallet, asking $25. 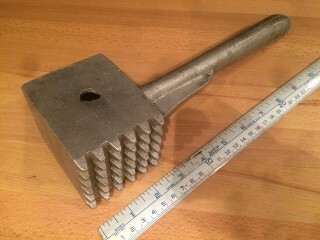 Extra large aluminum butcher's meat mallet, 2 1/2" x 2 1/2" x 11 1/2" long, weighs 2 lbs, asking $20. 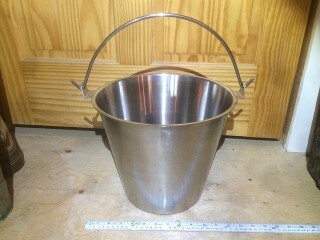 Clean 3 gallon seamless stainless steel milk pail, it measures 10" high x 12" dia. 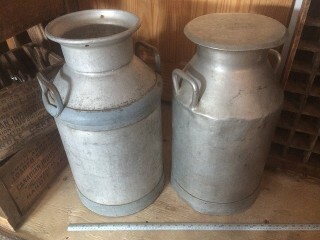 on top, was only used to milk the family cow with, asking $50. 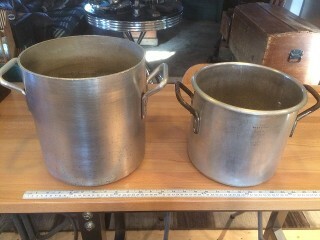 Aluminum cans, great for boiling maple syrup in, they measure 13" dia. X 23" high, asking $100. each. It's time for making wine for the season. $20. each. 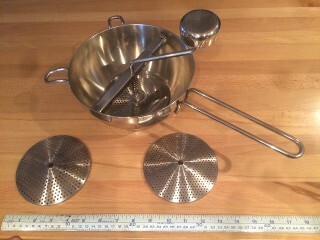 Stainless steel food mill strainer with 3 disks. 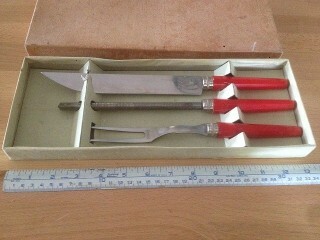 The perfect tool for preparing fresh purees, sauces, soups and more. asking $20. 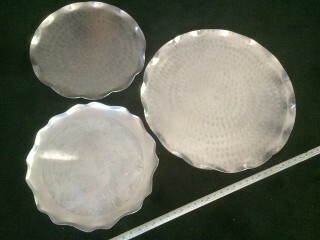 Vintage heavy aluminum serving trays, two 18" trays & one 24" tray, one is embossed with ducks on it,, asking $20. each. 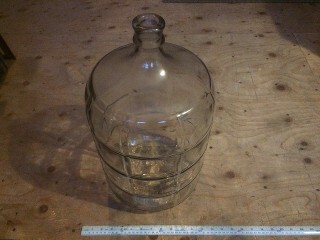 One small 18.8 lt. carboy, Made in Italy, asking $20. 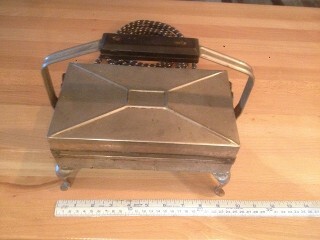 Antique 1909 Westinghouse electric waffle iron,(Sold). 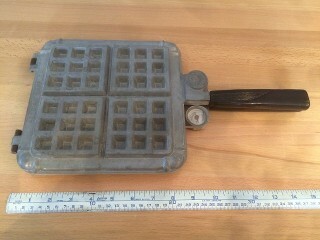 Vintage Nordic ware Begian stovetop waffler with temperature gauge on each side, (Sold). 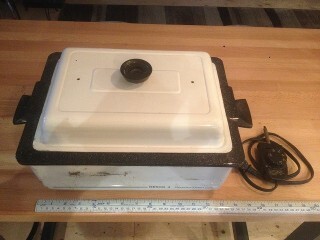 Vintage Nesco 4 quart roaster oven, asking $20. 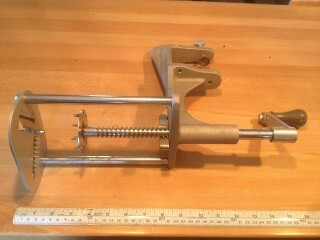 Commercial potatoe curly fry cutter & onion ring cutter, it clamps onto your counter top, great for chip stands, (Sold). 8 lb. 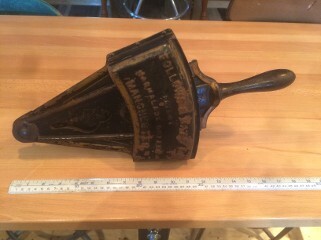 Horn style manual cast iron stuffer without tubes, asking $20. 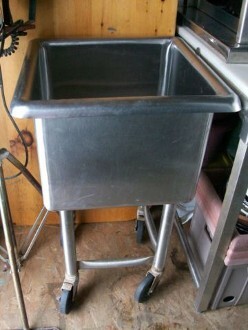 Restaurant Stainless steel sink on 5" casters with drain, great for washing large pots, it measures 17" x 17" x 13" inside and 20" x 20" x 33" high, asking $320. 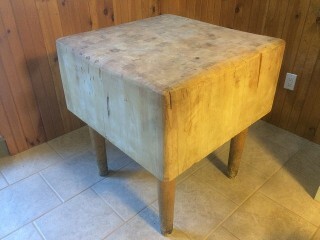 Restaurant rock maple butcher block, it measures 30" x 30" x 32" high, weighs about 400 lbs. (Sold). 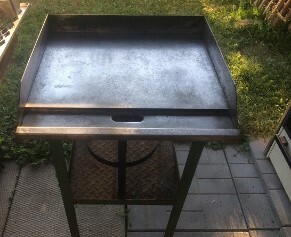 Propane griddle, it measures about 24" x 22" x 33" high, used with a portable propane tank in our summer kitchen, great for camps, (Sold). 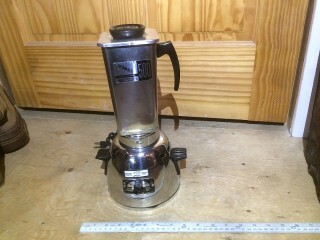 Champion industrial juicer model G5-NG-853S, heavy duty juicer, like new, (Sold). 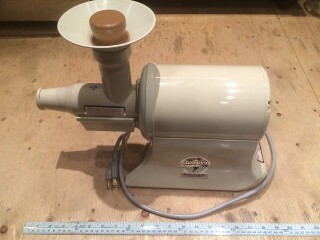 Waring Pro model #MG100A electric meat grinder with sausage stuffing horn, (Sold). Vintage VitaMix Blender Series 500 Vitamatic, all stainless steel, very clean condition, makes a great classic mixer for a bar, asking $120. 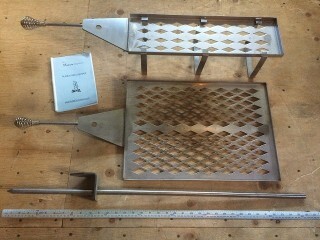 Muskoka grilling system stainless steel grills & stake for outdoors firepit with recipe book, asking $65. 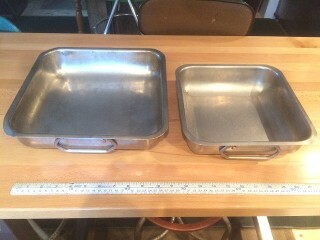 Commercial heavy stainless steel pans, they measure 12" x 12" & 10" x 10", asking $30. for the pair. 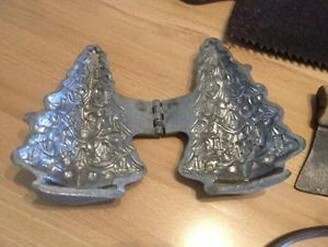 Pewter Ice Cream Mold Christmas Tree #1154, Made by Eppelsheimer & Co in 1880, (Sold). Antique cast iron clamp-on hand crank nut grater, Made in Ida Germany, By G.M.T. & Bro. very ornate flowers on casting, asking $55. 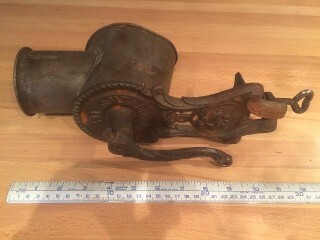 Antique cast iron hand crank cherry stoner pitter with Pat'd Nov. 17, 1863 & May 15, 1868 (Sold). 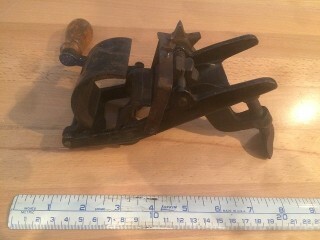 Antique 1890 Follows & Bate Manchester cast iron clamp on Marmalade cutter, asking $75. 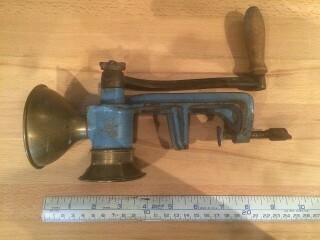 Antique clamp-on coffee grinder mill, made by Standard-Werk Company in Austria, (Sold). 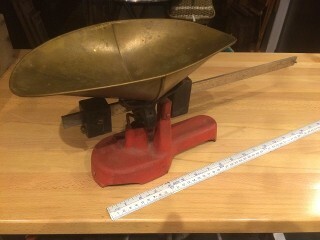 Large Chop-Rite model #32 meat grinder with sausage stuffer horn . (Sold). 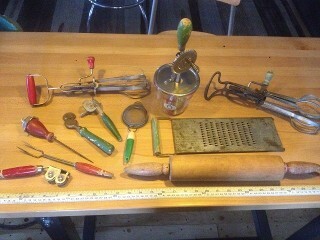 Antique Enterprise MFG. 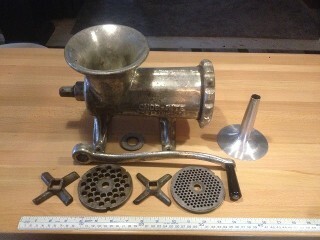 Co. Patented Sep 30th 1879, clamp-on hand-crank fruit press juicer, asking $95. Antique Steinfeld trade mark, patented Nov. 29, 1904 No. 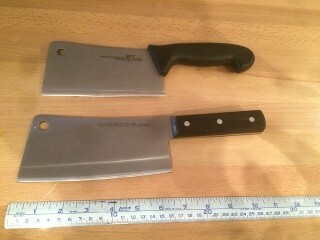 21 kitchen food chopper, asking $45.